Tim Sherwood returned to football after being appointed as manager at struggling Aston Villa on Saturday, with the 46-year-old given a three-and-a-half year contract. It is a tough task for the new boss, who takes over a team that dropped into the Premier League relegation zone after Tuesday's 2-0 defeat to Hull. Manager Paul Lambert claimed after that defeat his players had "13 cup finals" left to save their season - but the Scot won't preside over any of them after Villa decided to dispense with his services on Wednesday evening. Predictably enough, Sherwood sounds excited to be back in management - claiming that he "can't wait to get started" and is "really looking forward to the challenge". How did he do at Spurs? Sherwood was in charge of Spurs from December 2013 until the end of the season, when the club announced that they would not be keeping him on as manager. Chairman Daniel Levy had given Sherwood an 18-month deal and the manager's time in charge started superbly, with five wins and one draw from his first six league games in charge. But his team lost 5-1 to eventual champions Manchester City and 4-0 against Chelsea and Sherwood had the look of a dead-man walking for the final weeks of the season. Sherwood described himself as a "supply teacher" towards the end of the campaign and claimed that several players had approached him to ask if he would be in charge beyond the end of the season. He also said it was a "very difficult situation" to be in. Comments that will not have endeared him to Levy. But he managed to finish with a league win ratio of 59.09%, the highest of any Tottenham manager in the Premier League. Former colleague Chris Ramsey, now manager at QPR, believes Sherwood, who had previously been head of the Spurs academy, does not get the praise he deserves for the job he did at the club. "He did a fantastic job at Tottenham," said Ramsey. "I think they're reaping the benefits of some of the stuff that was put in place four or five years ago to help the academy. "I think it was probably underrated the job that he did." What can Villa fans expect from their new boss? A gilet? 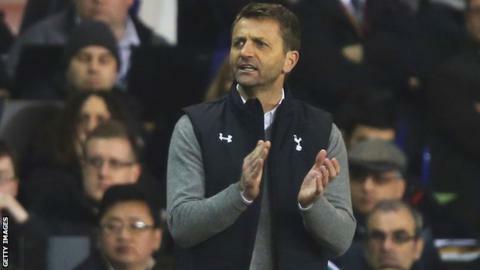 Sherwood almost made the sleeveless jacket a must-have fashion accessory in his time in charge at White Hart Lane, wearing it at pretty much all times as he stood on the touchline. Villa fans can also expect a great deal of passion from a man who does not duck a confrontation. In the last game of the 2013-14 season against, coincidentally, Aston Villa, the former England international decided that he had finally heard enough from a fan who had spent months shouting advice in his direction. Sherwood turned to face season ticket holder Danny - and a minute later the heavily-opinionated fan was handed the gilet and a seat on the touchline alongside coach Les Ferdinand. It made good copy but perhaps in hindsight, it was a managerial misjudgement from Sherwood. He also showed that he was not afraid to publicly lambast his players if he felt they had let him down. "There's a lack of characters. Too many of them are too nice to each other," Sherwood said after his side lost 4-0 to Chelsea last March. "We need to show a bit more guts and not want to be someone's mate all the time." BBC Radio 5 live's Pat Murphy suggests the West Midlands club will be a much livelier place with the new manager in charge. "It won't be dull at Villa Park," he said. "I wonder if owner Randy Lerner knows what he has let himself for. "Tim Sherwood does not suffer fools gladly and I doubt he will hold his tongue too much and one or two players may get a few rough words." What is Sherwood like to play for? The main beneficiaries of Sherwood's appointment may well be the youth players at Villa. Spurs had sold Gareth Bale in the summer of 2013 for a world record £85m and used the money to bring in expensive recruits such as Erik Lamela, Roberto Soldado and Paulinho. But the poor performances of the new signings contributed to Andre Villas-Boas dismissal in December 2013, giving Sherwood his first opportunity in management. It soon became clear that Sherwood was not afraid to put his trust in some of the younger players that he had coached during several years on the staff at White Hart Lane. Harry Kane has enjoyed a stellar season so far but it was Sherwood who gave the striker his first Premier League start, against Sunderland last April. Kane, perhaps not surprisingly, scored in that game. Algerian midfielder Nabil Bentaleb was given his debut under Sherwood, going on to make 15 appearances in the 2013-14 season, as well as defenders Zeki Fryers and Milos Velkovic and forward Alex Pritchard. Sherwood also helped develop current regular Ryan Mason when the midfielder was in the club's academy. "I think it is the right choice but there weren't many strong contenders. Sherwood has been linked with lots of jobs, Villa have finally gone for him and I think he's got it because there aren't that many people around." Sherwood initially joined the coaching staff in October 2008, brought to the club by then boss Harry Redknapp. Jermaine Jenas was at the club at the time and has happy memories of being coached by the new Villa boss. "I enjoyed working with Tim at Tottenham. I can't speak highly enough of him," Jenas told BBC Sport. "The work he did with the young players, the training sessions were fantastic, fitness levels too. When I was working with him I felt great." Academy coach Bradley Allen also praised Sherwood for his work at the London club. "Along with others, Tim was involved at close quarters with the development of a number of the young players at Tottenham," said Allen. "He oversaw that development and decided whether they needed to go out on loan to gain some experience at various clubs. "Those lads have come through the under-21 team and really flourished this season, with a good three or four of them holding down regular places in the first team, giving a new dimension to the side. Tim deserves a lot of credit for that." Villa players such as 19-year-old forward Jack Grealish and Republic of Ireland Under-21 international striker Graham Burke are among those who might benefit from Sherwood's arrival. What challenges face him at Villa? In short, some fairly big ones - starting with keeping Villa in the Premier League. It won't be easy, either, because the club are in the bottom three after a winless run of 10 league games in which they scored just two goals. Jenas said: "I have seen better sides go down. "Newcastle had a lot of quality, the West Ham side that nearly went down with Carlos Tevez. This Premier League is ruthless and you have to perform on the pitch. The names on the team sheet mean nothing." Finding the net has been a significant problems for Villa this season - they have scored just 12 league goals in 25 games, the lowest in Premier League history at that stage. His new side play Leicester in the FA Cup on Sunday in a game that will be broadcast live on BBC One. Then it is down to the business of league football, starting with a match against Stoke next Saturday. Mark Hughes's side will go into that game smarting from their embarrassing FA Cup defeat at Championship side Blackburn on Saturday. Villa do not play anyone currently in the top eight until April - but that could prove to be a decisive month for Sherwood as his team face fixtures against Manchester United, Spurs, QPR and Manchester City. Former Tottenham manager David Pleat thinks "it is a wonderful opportunity" for Sherwood and he has "enough players capable of avoiding the drop". Pleat added: "Tim is a confident man and will show strong leadership, but it will be different for him than at Tottenham, where he was well engrained in the club's way of working."